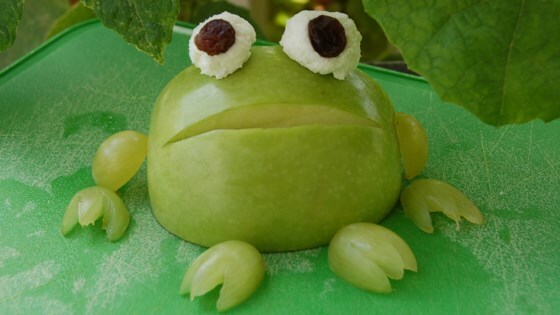 "I saw a frog like this on a hotel buffet and then started making them for my kids at home as a fun, cute snack that is also healthy!" Lay the apple sideways on a plate; cut out a thin horizontal sliver for the mouth. Arrange 1 grape half on each side of the apple as arms. Cut out 2 little triangles from the other 4 grapes so they look like toes and fingers and arrange them as hands and feet. Shape cream cheese into 2 little balls and stick a grape into each as a pupil. Stick creme cheese eyes on top of the quartered apple. Watch how to make a sweet, crispy treat that tastes like apple pie.